I don't usually post twice in one day, but since my neighbor J.P. made a special request, I will make an exception. Because she watched my chickens for four days. Even the spotted one that was very bad and ran all over, refusing to go in the chicken tractor. Anyhow, yesterday I gave her (J.P, not the chicken) some granola bars I made. 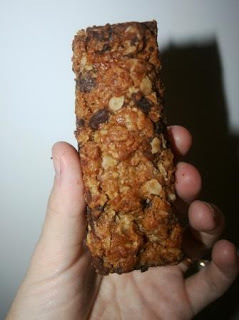 Now I've tried a lot of different granola bar recipes. But this is absolutely one of my favorites. Not only does it taste good, but these bars do not fall apart like so many homemade granola bars. This makes them perfect for taking along on hikes or snacking in the car. First, let me give credit where it is due. This recipe comes from my friend Maria at Living, Learning, Loving. 1. Preheat the oven to 350 degrees F. Spray a 9x13 inch baking pan with Pam. 2. In a large bowl, mix together the oats, brown sugar, wheat germ, cinnamon, nutmeg, flour, raisins and salt. Make a well in the center, and pour in the honey, egg, oil, vanilla and peanut butter. Mix well using your hands. Spread the mixture evenly into the prepared pan. 3. Bake for 30 to 35 minutes in the preheated oven, until the bars begin to turn golden at the edges. Cool for 5 minutes, then cut into bars while still warm. Do not allow the bars to cool completely before cutting, or they will be too hard to cut. *I actually have best results from cutting them right when they come out of the oven. Note: The version I made did not use raisins (ick). Instead, I substituted 1/2 cup Ghirardelli dark chocolate chips (drool). Also, I added 1 tbsp. ground flax seed. Where were they??? You mean I was in your house all day and never found the granola bars??????? oh man. raisins are scary. i'm so glad you didn't use them! also. a recipe is nice. but you know what would be nicer? if you just sent me a dozen or so. k, thanks. They sound and look yummy. Thanks for sharing the recipe too!